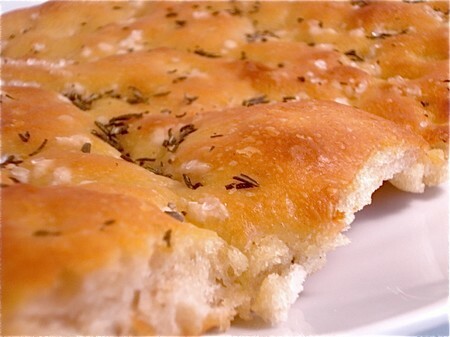 Focaccia is a popular style of bread made in Italy and spreading around the world in Italian communities. The bread is fairly flat, plain from inside, topped with herbs and olive oil and sometimes with finely sliced olives. A range of focaccia varieties exist and in the 21st century new varieties have been created due to the versatility of the basic recipe. Most historians believe that Focaccia originated with either the Etruscans of North Central Italy prior to the Roman Empire or in Ancient Greece at the beginning of the first millennium BC. Although flat unleavened bread has been made throughout the Middle East extending to Persia for this long as well and identifying a specific culture behind the first focaccia loaves is almost impossible. Focaccia bread is slightly different because the loaf rises slightly so it’s not traditionally unleavened bread and the focaccia recipe is mostly unknown in the Middle East, yet it has a history of being prepared in Turkey, Italy, Greece, Spain and France. Focaccia was historically unleavened, the recipe rises naturally in the right climate which gives a further clue to its origins, the further inland one goes the less dense the air becomes and considering so much of the inland Mediterranean is quite mountainous. We can speculate that it was inland people who first created the focaccia bread. Contrast to this with Phoenician people who originated in what is now coastal Lebanon and coastal Syria and then spread throughout the Mediterranean by 1100 BC were not known to eat bread with the same properties as focaccia. In coastal areas a small amount of yeast is needed to make the bread rise otherwise traditional flat bread would be the result. Its known that the name ‘Focaccia’ is derived from the Roman words “panis focacius”. Panis simply means bread and shouldn’t be confused with the modern English word pan, while used for baking bread is actually derived from the Latin word ‘patina’ meaning dish. Focacius is the Latin word for center or fireplace. Linguists conceive that since the fireplace was in the center of the house that the word could be used interchangeably. Focaccia in Roman times was cooked in the ashes of fire rather than on a tray above the fire so the translation seems right. Romans used to mix up a simple recipe of rough flour, salt, olive oil, water, a very small quantity of yeast and may have been seasoned with other herbs but in most cases was probably quite plain, this was then baked in the ‘focacius’. In Roman times focaccia was used as dipping bread, usually being torn apart by hand and dipped into salty soups made quite simply from water, vinegar and possibly olive oil. Today, this doesn’t sound very appetizing but it provided nourishment and was a cheap and filling meal for people doing long hours of physical labor. During the Roman ceremony of Saturnalia, a pig was sacrificed to please the Roman gods. In the later years of the Roman Empire a Lord of Misrule was chosen instead who would be feted upon while all the time wearing the costume of a pig. The Lord of Misrule was always a young man who was expected to act the part of a clown. A focaccia bread would be baked that included a fava bean and the lucky man to find the bean in his piece of bread became lord for the ceremony. The basic recipe of focaccia spread with the Romans to France and Spain where it became a popular bread to bake initially in less well off areas. In fact focaccia style breads were used widely to feed slaves in the Roman Empire and a shame still exists today in some countries. In Spain, pan de hogaza, the peasant’s bread which is made in a similar way to Roman panis focacius is also known as pan rustica, a homemade bread typically made in the countryside among the very poor. Focaccia style recipes in France such as fouaisse or foisse hat made in maroon are considered a daily bread by a significant part of the population and in bakeries is still one of the most popular selling breads. Similarly in the regions of Provence and Languedoc fogassa as it is known, focaccia breads are still very popular with bakeries and supermarkets all selling more fogassa than the French baguette which is a typical considered bread for France. In modern times since the medieval ages, the Catholic Church used focaccia quite widely during religious festivities, most often during the Eucharist and the unleavened recipe of focaccia is most commonly used. It was primarily owing to Christ’s use of unleavened bread during The Last Supper. 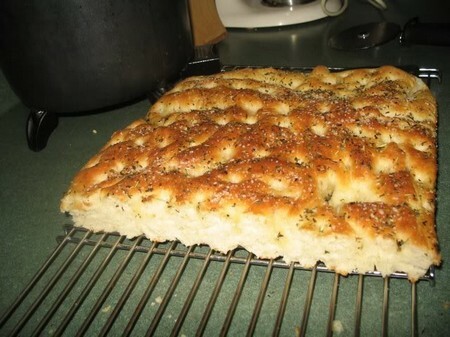 The tradition was derived from the ready availability of focaccia bread. The method is simple and some say pure recipe untainted with foreign ingredients thus representing Christ’s flesh which is of course considered entirely pure and free from sin. Italian immigrants to the United States in the 20th century brought recipes with them for pizza, bruschetta, grissini and of course focaccia. Arguably focaccia is no longer strictly the preserve of Italian communities, nowadays it can be found in almost all bakeries and supermarkets. Wide variety of seasonings are available and focaccia bread makes very tasty sandwich bread frequently served with fillings of cheese and ham.